A neighborhood near Manila's airport in the Philippines shows how poor planning impacts the urban environment. Photo by Storm Crypt. “If all production- and consumption-based emissions that result from lifestyle and purchasing are included, urban residents and their associated affluence likely account for more than 80 percent of the world’s GHG emissions,” says a new report, “Cities and Greenhouse Gas Emissions: Moving Forward.” The report suggests that policy and research should look at emissions within cities more carefully and distinguish between cities, provinces and national governments when developing emissions inventories. Not only are cities global economic and political drivers, but depending on the country, cities are more apt to participate in international climate change discussions. For example, more than 1,000 U.S. cities signed the Kyoto Protocol when the national government did not. Additionally, the most immediate beneficiaries of mitigation and adaptation measures are likely to be city dwellers. The report looks at international and local climate change policies as they relate to cities, as well as how lifestyle and geography impact GHG emissions. A chart on urban GHG emissions from the report, "Cities and Greenhouse Gas Emissions." 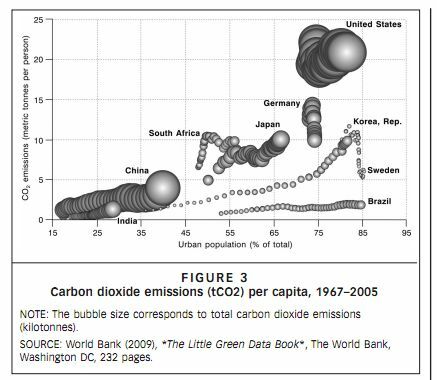 Disparities in per capita GHG emissions are not only evident between urban areas in the developed and developing world. “Variations between cities may be as high as variations within cities.” The authors address the often overlooked topics of lifestyle choices and consumption, reporting that “emissions are likely most closely correlated to affluence.” Even if emissions are low on a neighborhood level, affluent lifestyles are likely to offset these energy savings with activities like frequent air travel. To better understand how greenhouse gas emissions arise, the paper says that the Greenhouse Gas Protocol, developed by the World Resources Institute and the World Business Council For Sustainable Development, is effective because, perhaps most importantly, this methodology includes “upstream emissions” or those associated with the “extraction, production and transportation of products or services” that results from activities regardless of whether or not they occur within the city’s boundaries. In Toronto, for example, the report found that some very wealthy neighborhoods, even in the core of the city, produce as much carbon emissions as the suburbs because of individual lifestyles, infrastructure and the local economy. Per capita emissions in the major German cities of Frankfurt and Stuttgart are slightly higher than the national average. Dhaka’s emissions are twice that of Bangladesh as a whole. A few Chinese cities are responsible for four times as many emissions as the national average. Reasons include a high reliance on fossil fuels for energy production, significant industrial base in cities and a large and poor rural population. However, most cities listed typically emit about half or a smaller fraction of the national average. The report also found that land use is integral to the level of carbon emissions. Neighborhoods with dense residential areas, such as apartment buildings with good access to transit, typically have the lowest emissions. Other policy recommendations for local-level action on climate change include congestion pricing, restructuring land value taxes to increase the value of land served by public transit, traffic calming to discourage driving, driving and parking restrictions, green building codes, including “green roofs,” and retrofitting mass transit to reduce vulnerability due to flooding. 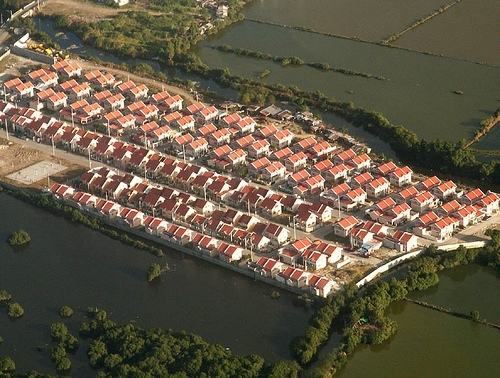 capita, shows a low-density suburban development.